You will find plenty of uses for this printed 2.1 Bluetooth speaker shaped like a can. 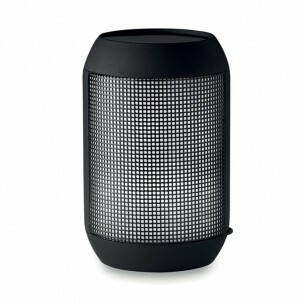 A fun and original promotional item, it has a changing LED light and is the ideal portable speaker for any occasion. It includes a rechargeable Li-Ion battery of 2000mAh, and the output is 3W 4 Ohm. It has USB and USB-C ports as well as a standard headphone socket, so it can be used with a wide range of devices. It's thee perfect branded item for any marketing campaign that involves music or entertainment. Print this product on the side (other positions may also be possible). Our bluetooth can shape speakers are made from plastic and is available in black. We print this speaker item in up to 2 colours via pad print, which is a technique suitable for almost all artwork and shapes.